Hello hello hello! Hope everyone is doing well and ready start the second month of 2017. I can’t believe January is already almost over. I’m working on Valentine’s Day cards since it’s a few short weeks away. 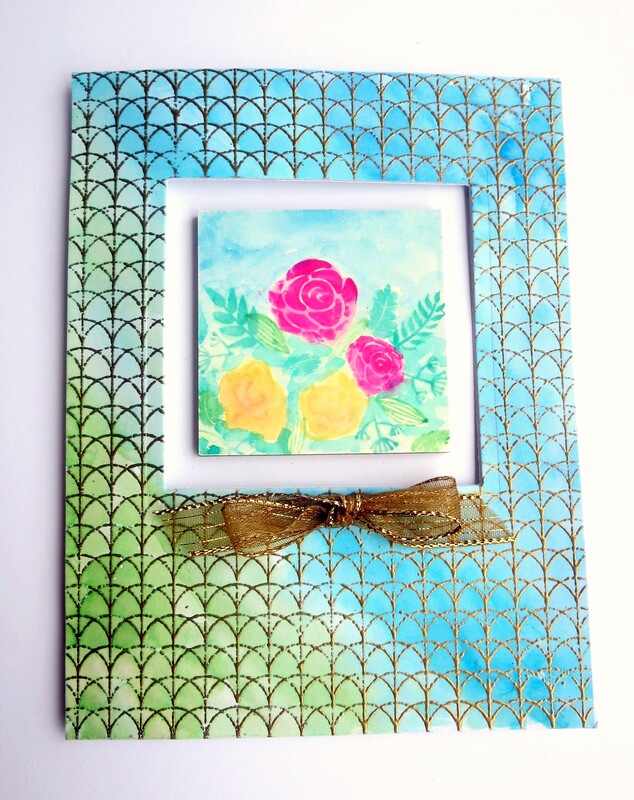 I used some distress inks to color my background and then made a stencil using the die. I placed is randomly on the watercolor base and used some distress glaze to create a barrier. I then sprayed the panel heavily with water and took it paper towels to soak up the water to lighten up the color. I used my scraps from the the original panel to die cut some smaller heart to scatter on the card. I heat embossed part of my sentiment and die cut the other with black card stock. Once all my elements were on the panel, I adhered it to a glittered cardbase and added Wink of Stella to the die cut word. Categories: anything goes, Handmade Cards, Hero Arts, Valentine, Watercolor | Tags: Challenges, Hero Arts, watercolor cards | Permalink. Hi, crafty friends, it’s Chark here today with Sunday’s post. I love the flexibility of the Flower Garden stamp set, because they are small stamps that go together in any configuration.The new Flower Stamp & Cut has some of the same flowers plus it comes with dies! I used a tiny Stampbord piece (little clay surface on wood that’s fun to stamp on) to stamp the flowers and leaves (using Tombow markers and then using a waterbrush to soften) and then added a magnet to the back. I attached it to the inside of my card and now it’s a removable little gift too. 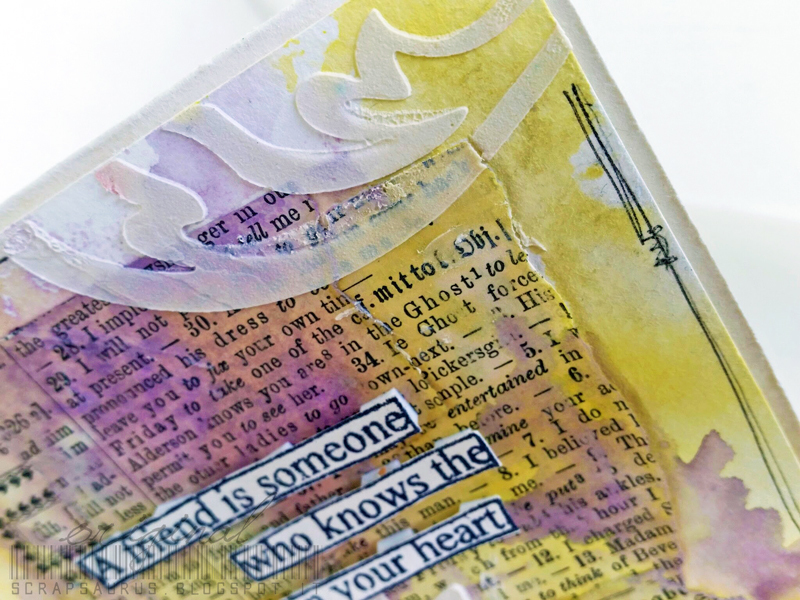 The background stamp is the Waves cling stamp which I embossed in gold and then watercolored with Distress Inks. I did a lot of watercoloring without using watercolors. That’s kind of odd…but it’s handy that my other materials work like paints, so I don’t have to get them out too! Remember, a2z is having a monthly contest that you can enter using any Hero Arts products to become eligible to win a $25 gift certificate to the store. The theme this month is Anything Goes—so as long as you use Hero Arts, you can enter any project! 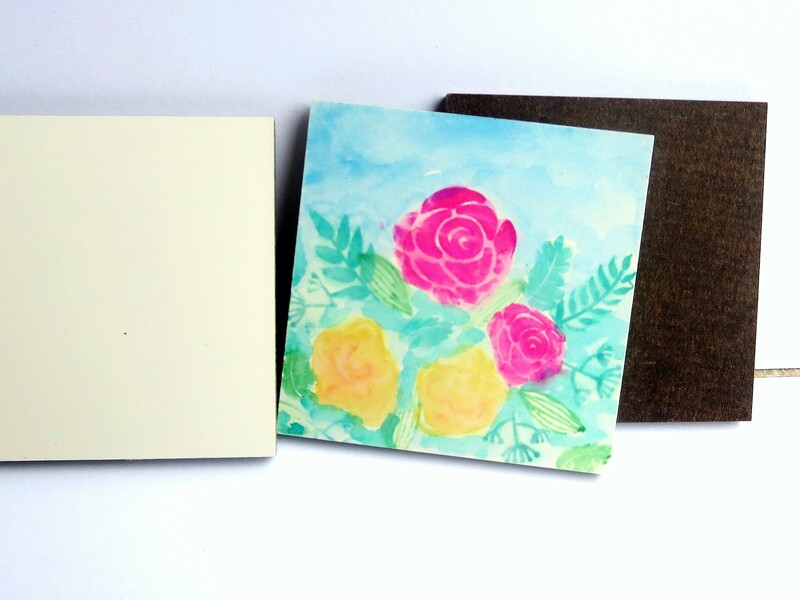 Categories: Watercolor | Tags: card, Cards, chark, Flowers, watercolor cards | Permalink. 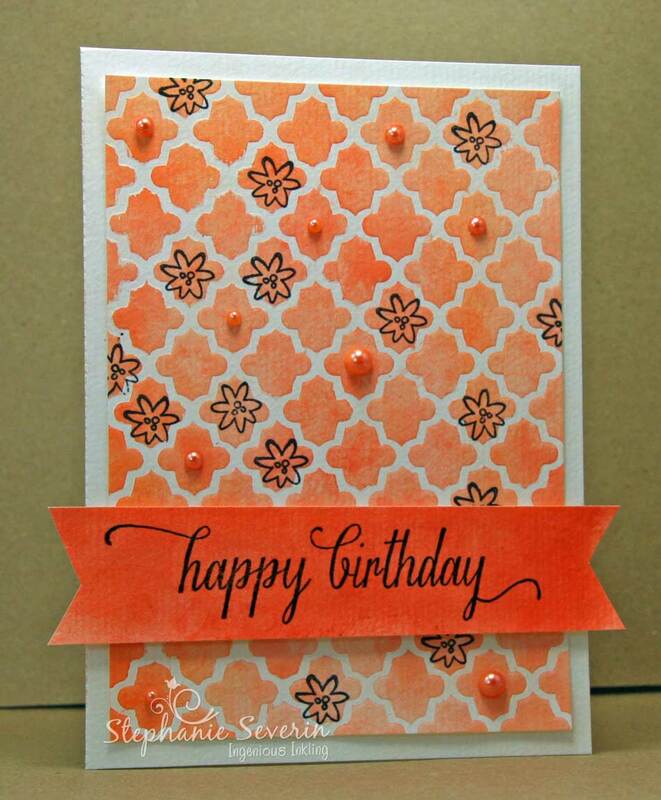 For today’s card I used two types of embossing to create a cheery birthday card. I started by dry embossing Hero Arts Tile Works Stencil onto watercolor paper. I left my stencil attached to the paper and then applied two colors of orange watercolor paint to the raised areas. I used a paper towel to dab away the excess paint before drying with my heat gun. 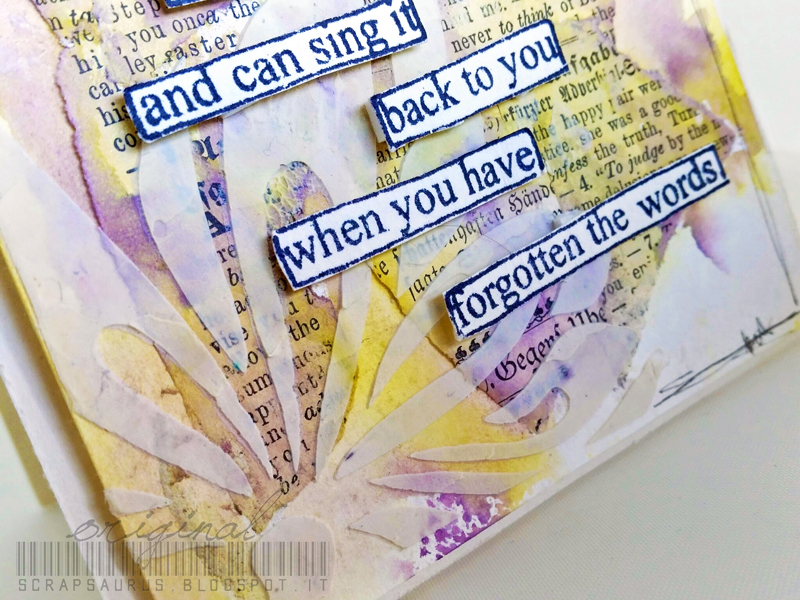 To decorate my background, I added the tiny flour from Messages with Flourish (flowers are perfect for the Nature Challenge at the Hero Arts Blog), as well as three sizes of Sunshine Hero Arts Pearls. I hope you’ll join us for our Embossing Challenge this month … and remember, you can use Coupon Code STEPH15 for 15% off your order of $25.00 or more (before tax and shipping) in the a2z Store … and the a2z Store has all of the 2015 Hero Arts release in stock (I can’t wait to play with those fun stamps). Don’t forget that we are on Twitter, Instagram and Facebook. Follow us on these different social media outlets so you won’t miss out on any fun promotions!. Categories: Birthday, Challenges, Embossing, Watercolor | Tags: a2z Scrapbooking Store, birthday cards, Cards, embossing, stencil, stencils, Stephanie Severin, Water Coloring, Watercolor, watercolor cards | Permalink. 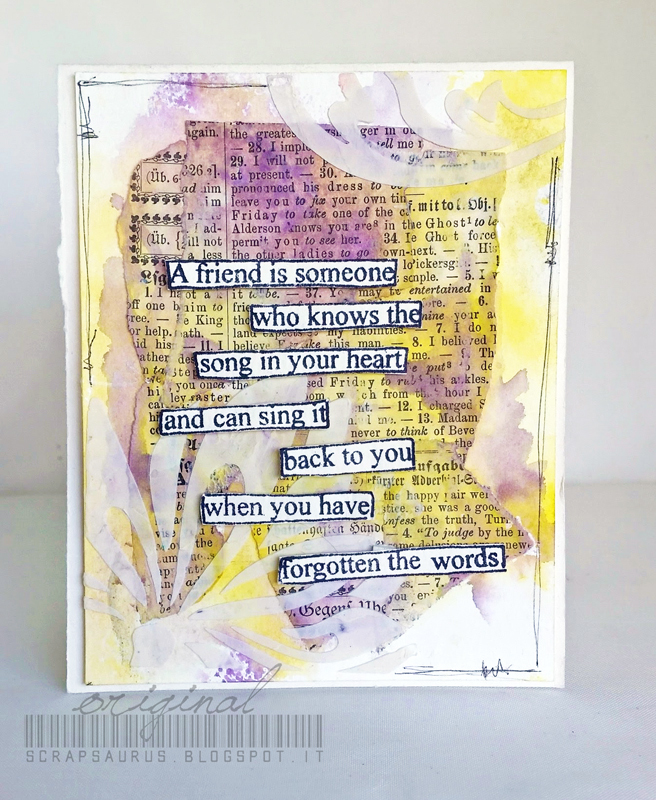 Good morning everyone – Jennifer here with another fun watercolor card for you! Gotta keep that mojo going for our monthly challenge…just 2 more days to enter to win that $25 store gift card! I love keeping stacks of colored watercolor paper on my desk and flipping through them like patterned paper when I need a background for a card. The one I used today was simply painted with some watercolor paints (nothing special, just ones I picked up at the local craft store) that ‘spoke’ to me. To add some interest, I grabbed the Large Lotus Pattern stencil, some Pool ink, and a sponge dauber and went to town. While that dried slightly, I grabbed…you’ll never guess…the Under the Mistletoe stamp set that was still on my desk for the sentiment. A Christmas stamp set on a non-holiday card! Talk about extending the use of your holiday stamps…anyway, I stamped that in the bottom corner with some VersaMark ink and heat embossed it using the HA White Embossing Powder. The lotus needed something extra, so I added Wink of Stella over it for the right amount of bling. A little Mocha layering paper behind the watercoloring, a bit of foam tape to attach it to the card base, and I was all done! 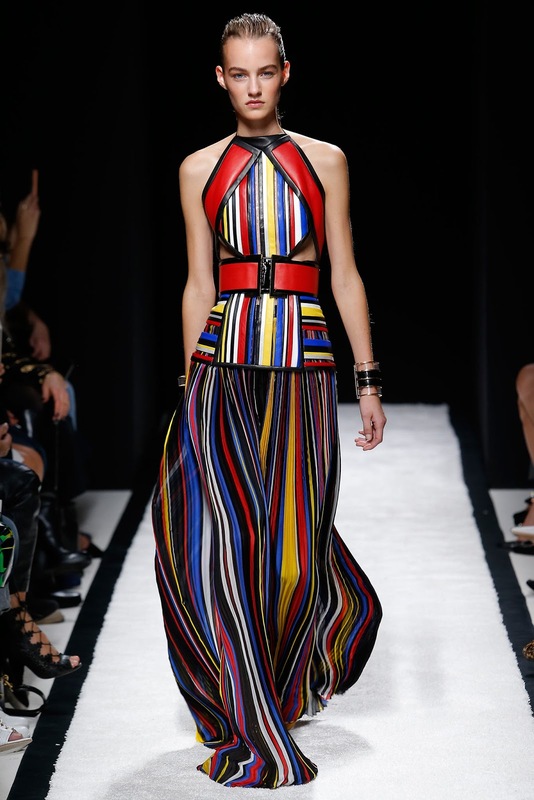 Wouldn’t you want to get this in the mail to break up the winter monotony? Be sure to stop on by the store to treat yourself to all the crafty goodies Santa neglected to bring you, and use coupon code JENNIFER15 while you’re there to save 15% off your order of $25 or more. Our Design Team Call ends at midnight tonight! If you would like to be part of a fun, creative team this is your chance to apply. 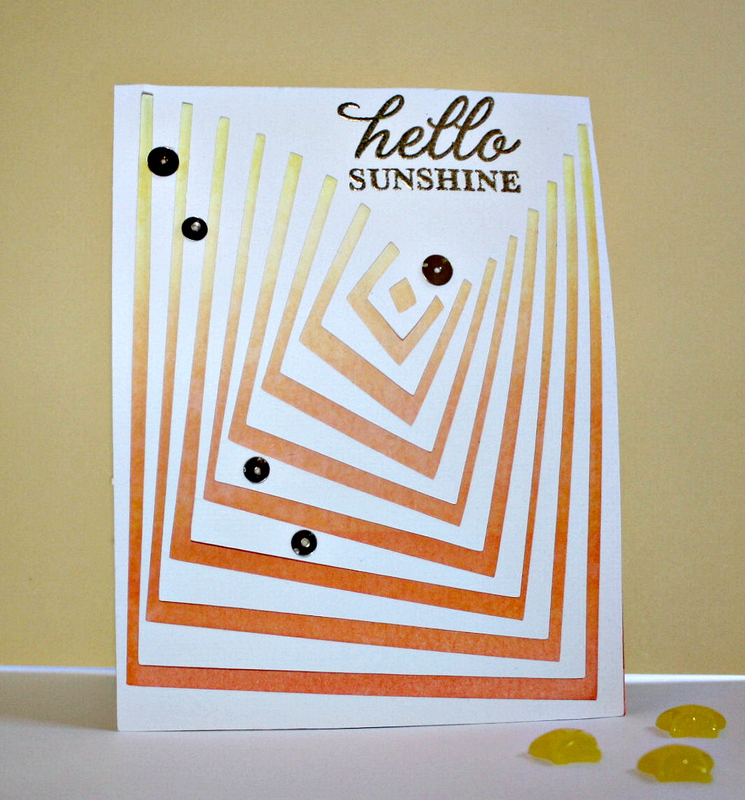 Just click here and link up a favorite card that contains Hero Arts Stamps from your Flickr stream or blog. Happy Crafting, and have a Happy New Year! Categories: Challenges, Handmade Cards | Tags: a2z Scrapbooking Store, Challenges, design team, Jennifer, watercolor cards | Permalink. Hero Arts Water Color Wheel has several shades of each color, so it was easy to start with light red, then orange and yellow. Then, I perused the Silhouette Store for a Hero Arts pattern to highlight the background that I had created. 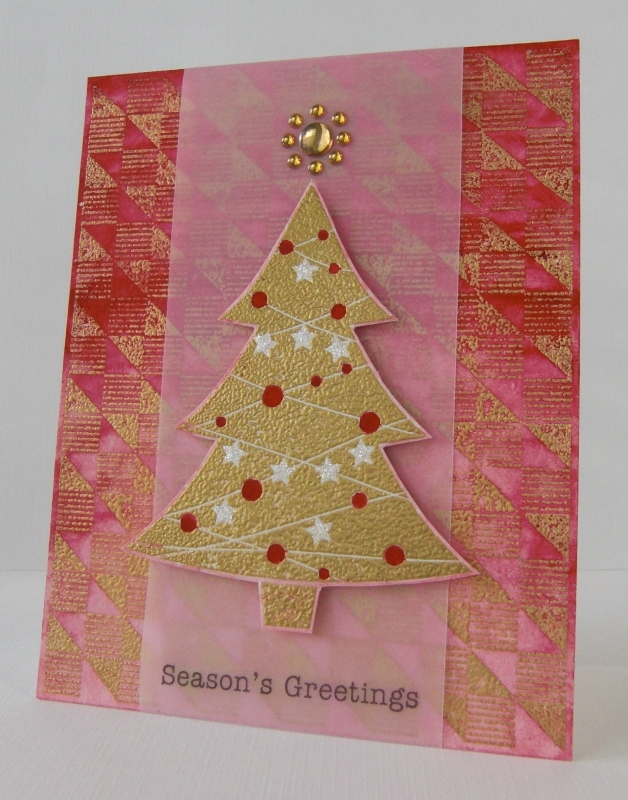 I used gold embossing powder for the sentiment, added a few gold sequins, and that was it! 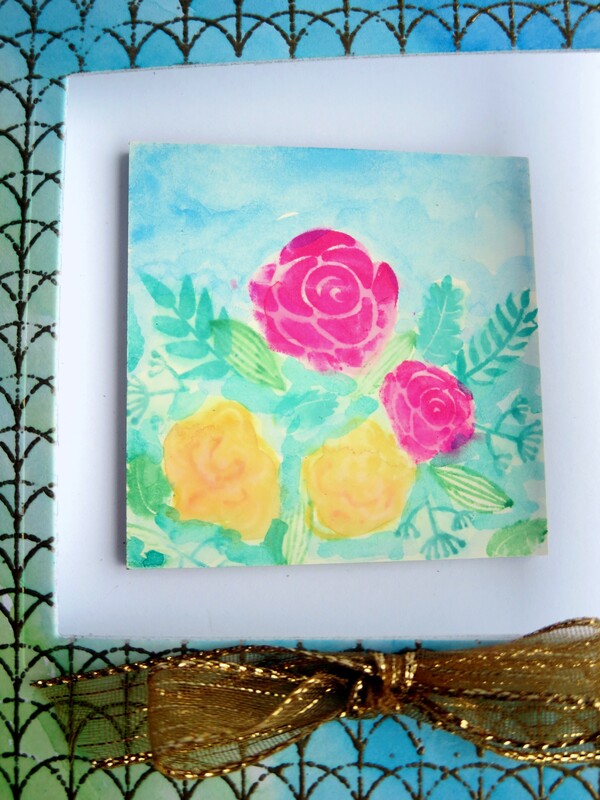 I hope my card inspires you to take out your water colors and try something new with your stamps! And, if you do, please feel free to enter your card in this month’s challenge by clicking on the link on the right hand side bar, or go HERE! You may enter up to five times to be eligible to win a $25.00 Gift Certificate to the a2z Scrapbooking Store with each entry. As always, you are welcome to use Coupon Code BARB15 for 15% off your order of $25.00 or more (before tax and shipping) in the a2z Store! I am also including an “Inlinkz” product list at the bottom of this post to link you to all these supplies! Categories: Handmade Cards | Tags: a2z Scrapbooking Store, die cuts, Friendship Cards, Heat Embossing, Hero Arts, watercolor cards | Permalink. Hello everyone. Greta here with a Christmas card that won’t need extra postage. Our challenge this month is to use watercoloring on your project. I began by stamping & heat embossing the background in gold on watercolor paper. Then I used a dark red watercolor paint with a wet brush using more paint at the top & more water moving down to create an ombre look. I added a piece of vellum down the center with a stamped sentiment at the bottom. The tree was also heat embossed in gold on another piece of watercolor paper brushed with the same paint. I trimmed it very close, eliminating the stars. The dots were colored with the paint nearly full strength & I added Stickles to the stars. When everything dried I mounted it with foam tape & added gold dots at the top. Hope I’ve inspired you to join our challenge. You can use my discount code, GRETA15, to get 15% off a minimum $25 purchase in The Store. Designer Star Tree or you could use Sparkling Holidays ON SALE! Categories: Challenges, Christmas, Handmade Cards, Watercolor | Tags: Christmas Card, design team, embossing, stamping, watercolor cards | Permalink. The December Challenge is all about Watercolors … so I decided to play with my Hero Arts Watercolor Wheel and the BasicGrey Two Way Arrows Stencil. I started by cutting a piece of Watercolor Paper in half, and taped down my stencil on all four sides (I tape it to my work surface as well to minimize movement). 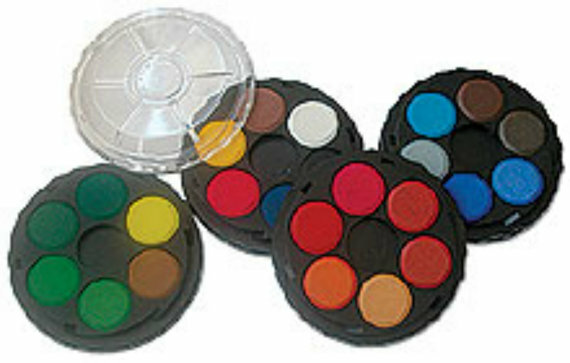 Look at all of the colors you get in the Watercolor Wheel. For my first attempt (on the right), I used two shades of blue paint and as little water as possible (to try to minimize the paint running under the stencil). It worked better to get the paint on the end of the paint brush and sort of *pounce* it into the paper. 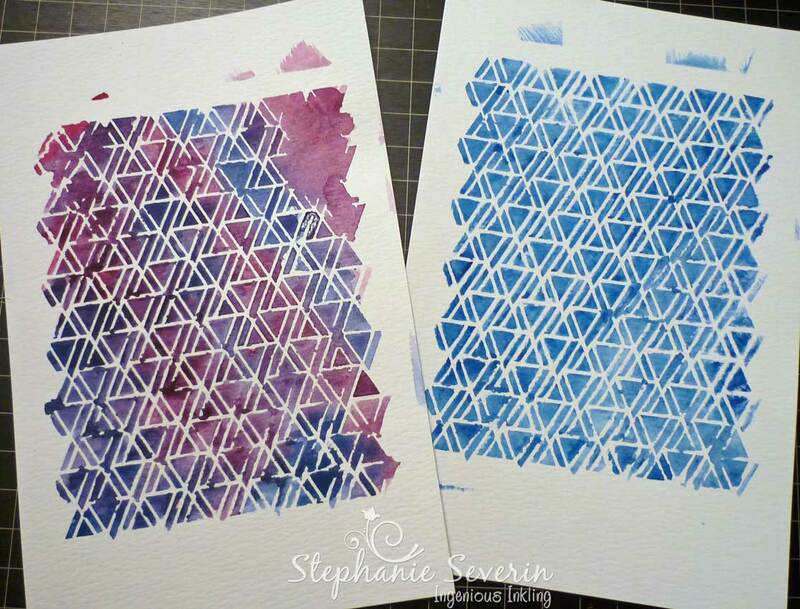 For my second piece (on the left), I alternated between blue and red paint to produce a more gradient color effect. One trick for getting the stencil image possible is to use your heat gun to dry the paint before removing the stencil from your paper.. You can also dab any remaining wet spots with a paper towel. Since the lines on my blue stenciled design were a bit more crisp, I went with an over-all graphic design inspired by this Spring Outfit by Balmain at the Runway Inspired Challenge. I used lots of straight lines and a bold straight-font sentiment from Hero Arts Yay! Did you notice that the corner on the top right of my second attempt got a bit messy? … I call that an *embellishment opportunity*. 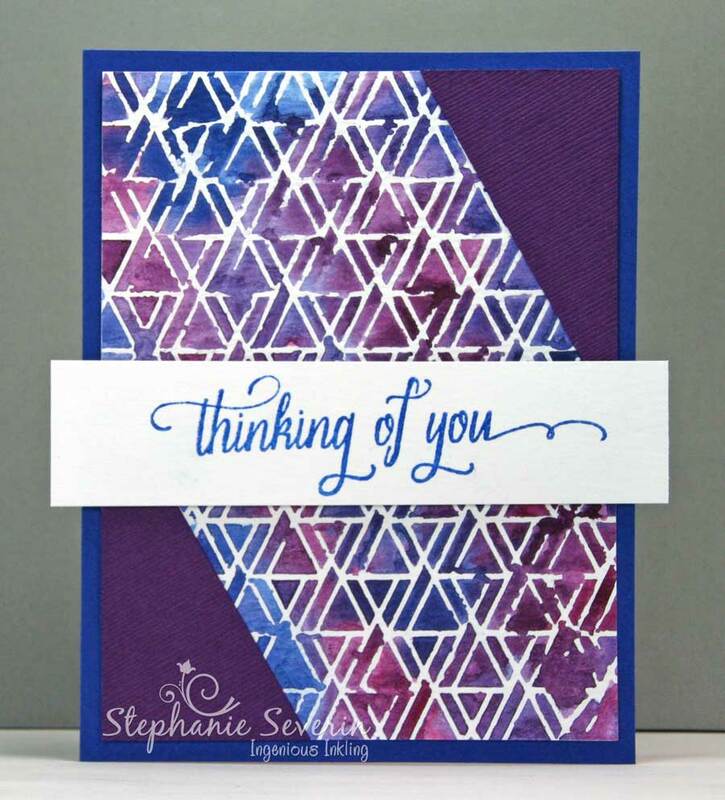 I lined-up scraps of purple paper with the the lines in the stencil, and then trimmed the edges into triangles. Since this stenciled watercolor had a softer feel, I used a more flowy font from Messages with Flourishes. Remember how fun playing with watercolors was in grade school? … well it’s still just as much fun as an adult. I can’t wait to see what you create for our December Challenge. As always, you can use Coupon Code STEPH15 for 15% off your order of $25.00 or more (before tax and shipping) in the a2z Store. 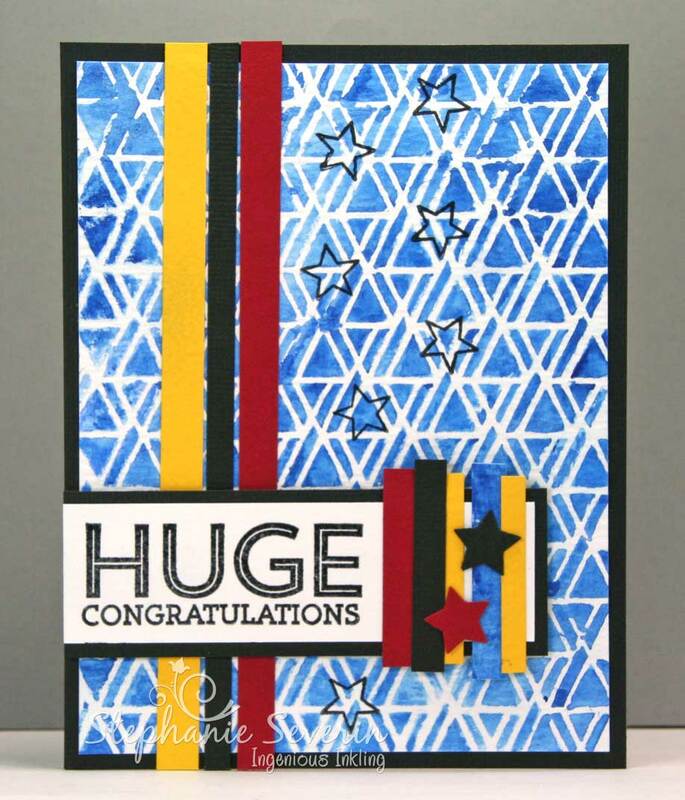 Categories: Challenges, Handmade Cards, Watercolor | Tags: a2z Scrapbooking Store, Congratulations, design team, Hero Arts, stencil, stencils, Stephanie Severin, Thinking of you, watercolor cards | Permalink. This is Zoey , your new Italian bff! Today I am here to show you how I created a card for a friend. The theme of this card goes along with our monthly challange – that if you haven’t read about it yet, it is about Encouragement. So I cut my front panel of the card…and then I cut few pieces of an old book page, I adhered the pieces to the paper and then I distressed it a bit. I grabbed my Hero Arts Purple Neon Spray WM108 and also my Hero Arts Butter Bar Spray WM112 – as you know these two are usually used as Spray, but today we will use them to create a watercolor effect for our background! Just simply mist the spray over a craft Sheet (or anything that will not stick !) , I then added some more water and I simply placed the card over the colors, I let it sit for few seconds and then I picked the piece up. That was the result…and I loved it at the first try! I let the paste dry alone, but in case you want to speed up the process you can use the heat tool — just make sure to move the heat tool around to prevent bubbles! Last thing I did was stamping the sentiment with Hero Arts India Ink Black AF248 and adding some lines with a black gel pen to border my background. And that is the final result – what do you think about it? I hope you will give it a try and use your spray mist in a different way! 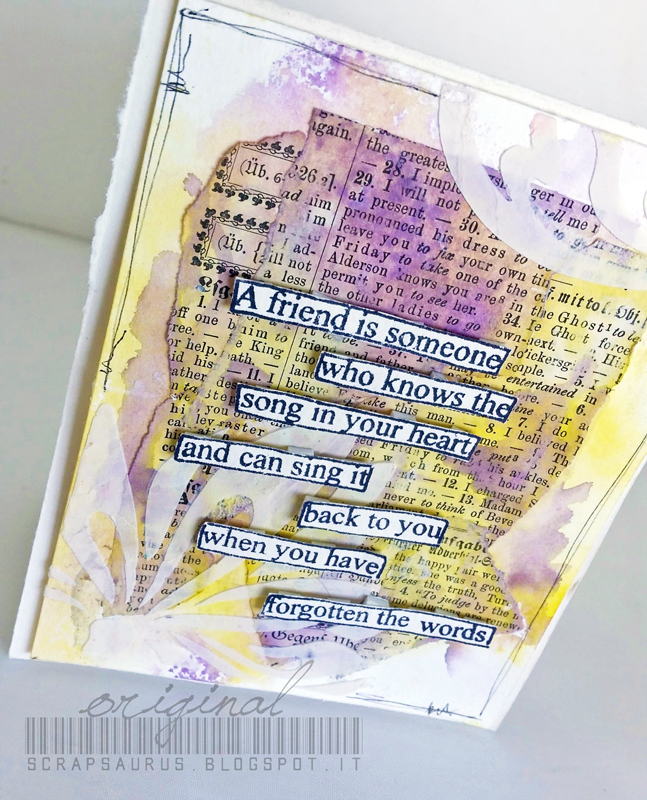 Categories: Friendship Cards, Watercolor | Tags: Encouragement, Friendship Cards, stencils, watercolor cards, Zoey | Permalink.